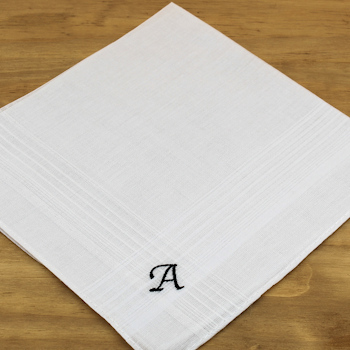 Mens 36cm lightweight sheer white cotton everyday handkerchief, thin and soft for less bulk in pocket. Select from one single hanky or make it a gift set of 3 handkerchiefs. Embroidered with a single initial in your choice of thread colour and letter font style. You can choose to add gift presentation.